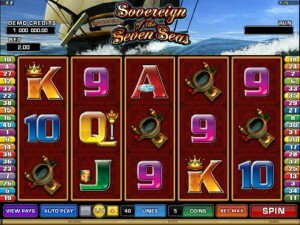 With a name like Sovereign of the Seven Seas, you get the picture immediately that it’s a marine themed game. The focus is not as much on pirates, as it is on the sailors which used sail ships to go over the seas, brave men that survived storms and ship battles. The game comes from Microgaming, a company recognized for the quality of their slots, but they didn’t do as great a job in this case. Despite the high number of lines, the slot looks rather old. You can select a maximum of 40 lines each round, all of them being on the same 5 reels. 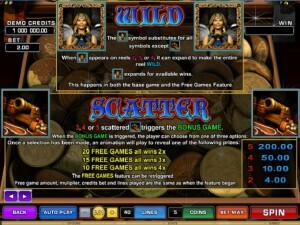 The slot has scatter symbols, multipliers in its free spins and wilds which can expand. It also has a $40,000 top prize. The design is hardly worth mentioning, but the features are another matter. You will find both expanding and regular wilds in the game, scatters which give you bonus games, and then you can choose what free spins and multipliers you want to get. The Female symbol gets the main role in this game, so I assume she’s the sovereign that the title mentions. As a wild, she substitutes for all symbols, with the obvious exception of the scattered Canon. One thing you will enjoy about it is that the wild expands when it appears on the reels 2, 3 or 4, as long as this will result in a new win. You get this feature both during free spins and base game rounds. The scatter symbol is next, which as always appears wherever it wants and yet still is able to give you prizes that will make you smile. These prizes start from a value worth as little as 2x the bet, and go up to 100x the bet when five Canons are visible at the same time. 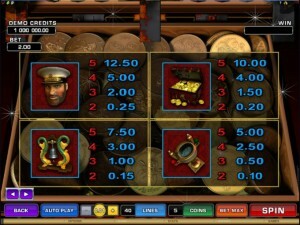 The free spins begin with a choice, which you get when 3+ Canons are scattered on the reels, at the same time. You pick which of the three options you prefer, and the feature starts. The first one gives you 20 spins for free and 2x multipliers. The second option has 3x multipliers, but the free spins drop to 15. 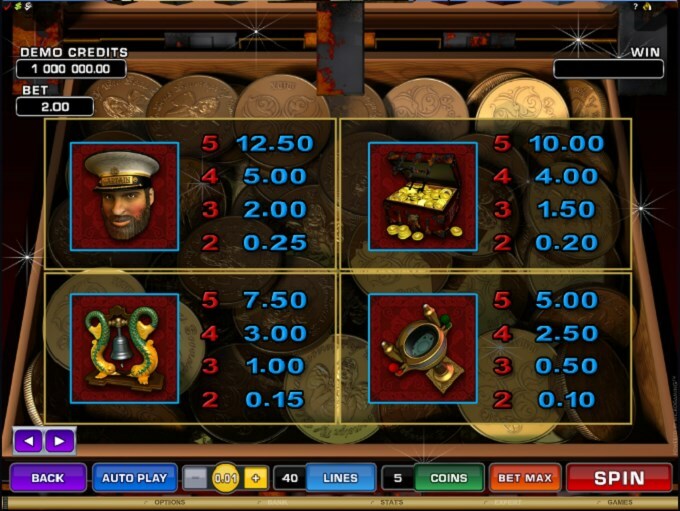 The third and final option has the fewest free spins, 10, but the multiplier goes up to 4x. This is a feature which can be retriggered. 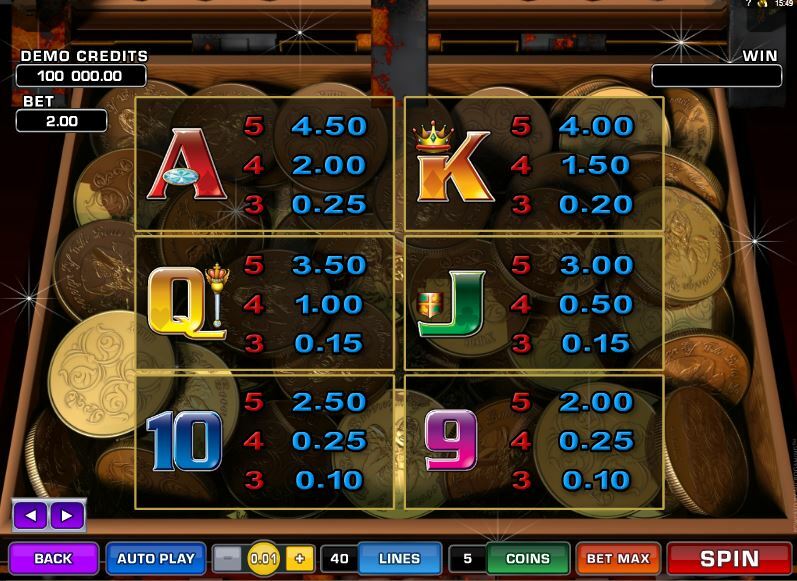 Even though the maximum bet is as high as $200, the prizes tend to be quite low in this game. The 40 lines can get wagers of up to $5, using 5 coins of $1 to get there. The minimum denomination of a coin is $0.01. A $1,250 top prize is won when the player gets a five symbol combo with the Captain, but the scatter symbol awards a much better 200x the bet prize, which means $40,000. The design style is one of the things I disliked most about this slot. The background image is OK, shown at the top and with an image of a sail ship on the rough seas. The reels are dark red and decorated, but they don’t fit in with the rest of the design. The symbols are the weakest part though. Both the themed symbols and the playing cards look dated. Symbols: Sovereign (wild), Canon (200x the bet, scatter), Captain (250x), Treasure Chest (200x), Bell (150x), Compass (100x), Ace (90x), King (80x), Queen (70x), Jack (60x), 10 (50x) and 9 (40x). I’m not a fan of the design you get from it, but the features are decent if you can get passed the look. You also have plenty of pirate themed games out there with much better looks, though this isn’t about pirates exactly, so it’s not the same thing. 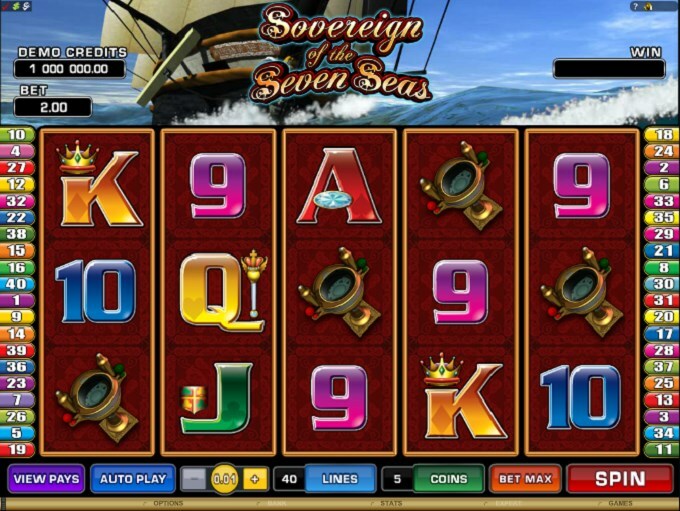 The Sovereign of the Seven Seas slot machine is offered through the Microgaming platform, so if you want to play it for real or just to practice, look out for casinos that use it.